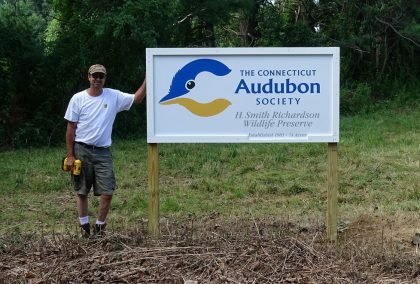 July 21, 2016 – You may have noticed changes recently at the H. Smith Richardson Wildlife Preserve, on Sasco Creek Road in Westport, with more on the way. We’re collaborating with a group of enthusiastic neighbors to make big improvements to the preserve, for the birds and other wildlife that rely on it now, and for the many more that will. A meadow restoration on the 12-acre north parcel is all-but-complete. We’re happy to report that Eastern Bluebirds, Tree Swallows and Eastern Kingbirds are already nesting there. During migration, a pair of Bobolinks – one of the state’s rarest grassland birds – stopped by for several days. These birds are habitat specialists. The won’t nest just anywhere. They need meadows or open areas with only a few trees. And the work at Smith Richardson has provided them with exactly what they need. As recently as six or seven years ago, that parcel was choked with invasive vegetation. Asiatic bittersweet. Multifora rose. Mile-a-minute weed. Barberry. Over several years, we removed them and planted a mix of cool-season grasses. Some small trees and shrubs still must be removed, and we’ll be mowing again later this summer. But the change has been remarkable enough to allow the bluebirds, kingbirds, swallows and Bobolinks to use the preserve. The south parcel is even more choked with invasives than the north. Our plan is to remove, replant, and restore. The work started with two community cleanup days organized by the Friends of Smith Richardson neighborhood group. Next, we will create a meadow of native wildflowers chosen to attract pollinators. Conifers and native hollies will be planted in clusters, to provide cover for the Saw-whet, Barred and Great Horned Owls the sanctuary is known for. The sanctuary’s soils even show that we might be able to create an Atlantic White Cedar Swamp, one of the region’s rarest habitats. It’s not a quick project. We expect the work to take several years. But it will transform the sanctuary and, we believe, improve the local environment. There’s a longer description of the sanctuary here. Thanks! We hope to see you on the trails.